Woo, a c-c-cold start to the new week! Monday morning temperatures have fallen to the 20s and 30s across most of New Jersey — easily one of the coldest mornings of the season so far. You'll definitely need a jacket as that wintry air smacks you in the face! And you'll probably still need a jacket or sweater throughout the afternoon too. Monday afternoon's high temperatures will end up around 50 to 55 degrees. Slightly cooler and less windy than Sunday, but still holding about 10 degrees below late October seasonal normals. While there are differing opinions amongst the forecast models, I'm leaning toward a mostly sunny sky thanks to high pressure building overhead. A few clouds will appear overhead Monday evening. As a warm front lifts into New Jersey, a few sprinkles will be possible too — but the chance is so slight and any rainfall would be so light, I'm not even mentioning it in my "official" on-air forecast. Monday night's low temps will dip into the upper 30s to mid 40s — not as cold as the previous night, with only limited patchy frost expected. Tuesday will be the one warmer day of the week, with temperatures surging into the lower to mid 60s. (Not bad!) We'll see a mix of sun and clouds, with a brisk wind up to 20 mph. That wind will start southwesterly, but a cold front will push winds to a northwesterly by the end of the day. Yes, another cold front. And so the warmup will be short-lived. The front looks pretty moisture-starved, so I've opted for a dry forecast. However, by Wednesday, high temperatures will fall back into the lower to mid 50s. The breeze stays elevated throughout Wednesday, so it may be blustery at times. Skies should once again become mostly sunny. It will get even colder for Thursday and Friday, as thermometers struggle to even reach 50 degrees. Clouds will increase as the weekend approaches. And then the forecast gets difficult. And potentially nasty. 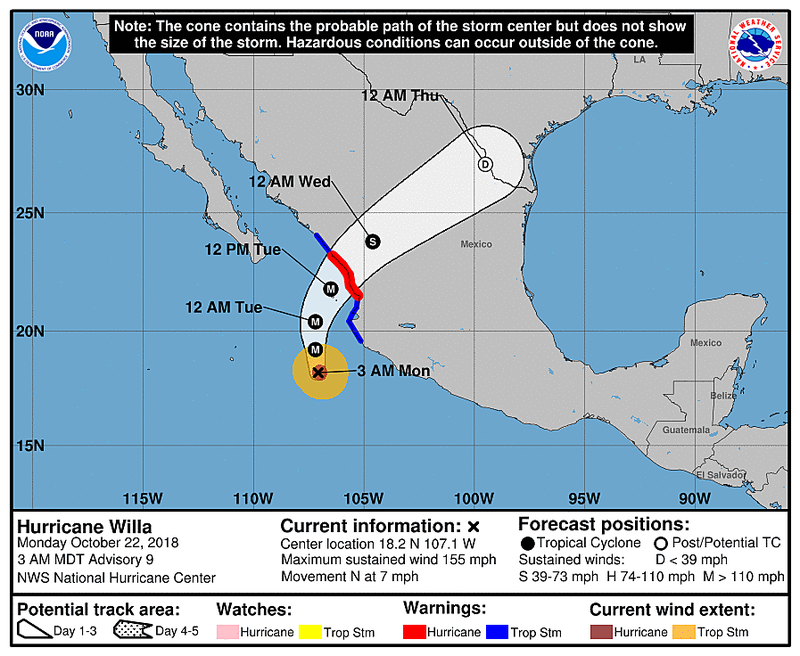 As of this writing, Major Hurricane Willa is spinning in the Pacific Ocean about 200 miles southwest of Puerto Vallarta, Mexico. Now, I very rarely mention Pacific hurricanes here in the NJ weather blog. (It is 2,400 miles away, after all!) But this one could eventually track our way. Willa will make landfall along the central Mexican Pacific coast late Tuesday, bringing heavy rain to South Texas by Thursday. The storm system — no longer tropical — will skirt along the Gulf Coast, and then slide up the Atlantic seaboard. Given that storm track, I'm comfortable calling it a potential nor'easter — although I prefer the less hype-y coastal storm moniker. --Worst-case scenario would be an extended period of heavy rain and 40+ mph wind gusts, especially along the Jersey Shore. --Best-case scenario would be a complete miss, out to sea. --We're really not talking about snow here. The storm itself should carry some warm, humid air with it, so even a direct hit would produce "just rain". Having said that, cold air will arrive behind the storm, so there could be some snow showers in NW NJ on the backside. --In addition to the uncertain storm track, there are significant questions regarding timing. The GFS model paints the biggest impacts from Saturday afternoon through midday Sunday. The Euro model is earlier, from Saturday morning through Sunday morning. Big difference in terms of making weekend plans, obviously. So it's remains a worth watching, stay tuned kind of situation. We'll start putting some finer details on the weekend forecast around Wednesday.